America’s Data Centers Consuming Massive and Growing Amounts of Electricity - Cutting Server Room Energy Waste by 40% Could Save Businesses Over $3 Billion Annually. All of our online activity -- including email, internet use, social media, and conducting business -- is delivered through nearly 3 million data centers across America, from small closets and larger server rooms, to mammoth “cloud” server farms. Their explosive growth is gulping huge amounts of energy, and despite some efficiency improvements much of it is still wasted. Although well-known internet brands like Apple, Facebook, Google and others rightly pride themselves on the ultra-high efficiency of their immense data centers delivering search, social networking and other digital services to consumers and businesses alike, according to a new report from NRDC and Anthesis, these cloud server farms are responsible for less than 5 percent of total data center energy consumption in the nation, and are not representative of how the average U.S. data center operates. Anthesis partnered with the NRDC to undertake research which shows that many small, mid-sized, corporate and multi-tenant data centers still waste much of the energy they use. One of the key issues is that many of the roughly 12 million U.S. servers operate most of the time doing little or no work but still drawing power – up to 30 percent of servers are “comatose” and no longer needed but still drawing significant amounts of power, many others are grossly underutilized. However, opportunities abound to reduce energy waste in the data center industry as a whole. The technology exists, but systemic measures are needed to remove the barriers limiting its broad adoption across the industry. The rapid growth of digital content, big data, e-commerce, and Internet traffic more than offsets energy efficiency progress, making data centers one of the fastest-growing consumers of electricity in the U.S. economy, and a key driver in the construction of new power plants. 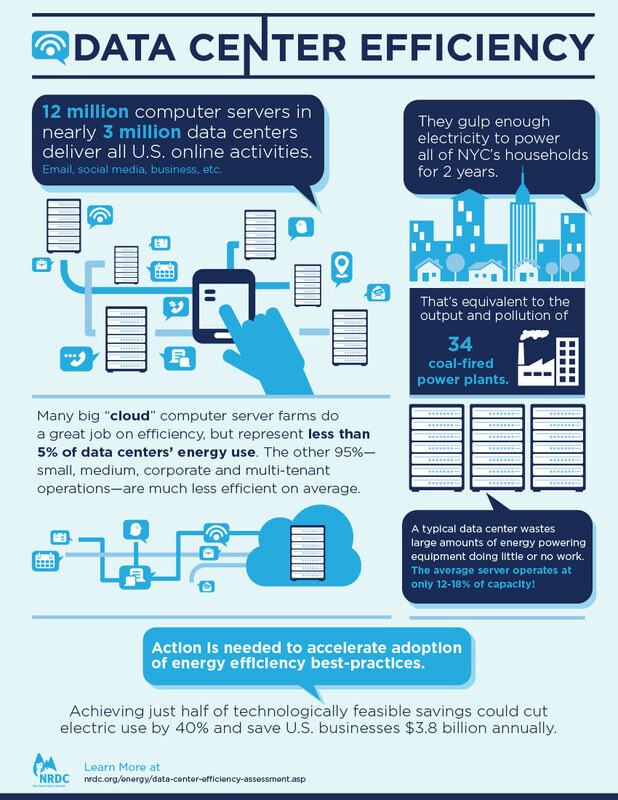 In 2013, U.S. data centers consumed an estimated 91 billion kilowatt-hours of electricity. That’s the equivalent annual output of 34 large (500-megawatt) coal-fired power plants -- enough electricity to power all the households in New York City twice over for a year. Meanwhile, data center electricity consumption is projected to increase to roughly 140 billion kilowatt-hours annually by 2020, requiring the equivalent annual output of 17 new power plants, costing American businesses $13 billion annually in electricity bills and emitting nearly 150 million metric tons of carbon pollution annually. 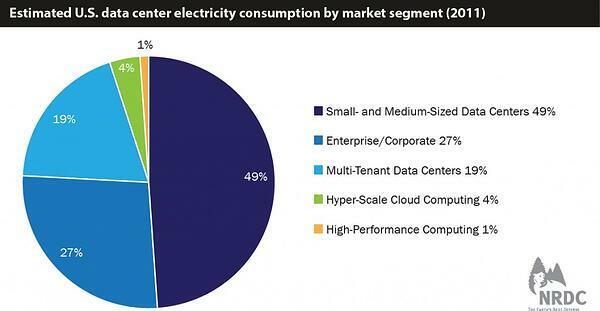 While most media and public attention focuses on the largest data centers powering so-called cloud computing operations -- companies that provide Internet and other web-based services to consumers and businesses -- these hyper-scale cloud computing data centers represent only a small fraction of data center energy use in the United States. Instead, the vast majority is consumed in small, medium, and large corporate data centers as well as in the multi-tenant data centers to which a growing number of companies outsource their data center needs. NRDC's previous report Is Cloud Computing Always Greener? found these smaller data centers have generally made much less progress than their hyper-scale cloud counterparts. Our latest analysis shows energy efficiency advances are being hampered by persistent issues and market barriers such as lack of metrics and transparency, and misalignment of incentives (i.e., the person who makes the decisions affecting efficiency is rarely the same person paying the energy bills). For example, in 80 percent of organizations, the department responsible for data center management is separate from the one paying the electric bills. This “split incentive” reduces the likelihood of implementation of commonsense efficiency measures. "Data centers should be seen as part of the solution to climate change, and are delivering many benefits, both direct and indirect as previous studies and organizations note, however, they also need to become more efficient," said Josh Whitney, Partner at Anthesis and the report co-author. "We strongly support the use of information technology and data centers to make the rest of the economy more efficient through enabled benefits like reduced business travel, the 'internet of things' connecting smartgrid, buildings, and transportation networks, or by increasing commerce and productivity gains through the analytics of big data. But to play the role as the provider of “intelligent efficiency” in a low-carbon economy, it needs to become more efficient itself." Adoption of a simple server utilization metric. 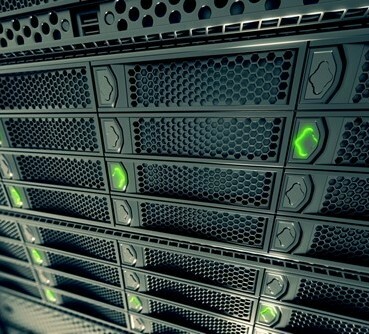 One of the biggest efficiency issues in data centers is underutilization of servers. Adoption of a simple metric, such as the average utilization of the server central processing unit(s) (CPU), would help resolve that issue. Measuring and reporting CPU utilization is a simple, affordable, and adequate way of gauging data center efficiency that could be used immediately to drive greater IT energy savings. Rewarding the right behaviors. Data center operators, service providers, and multi-tenant customers should review their internal organizational structures and external contractual arrangements and ensure that incentives are aligned to provide financial rewards for efficiency best practices. Multi-tenant data center stakeholders – those served by a single facility where they lease space, power, Internet connectivity, etc. 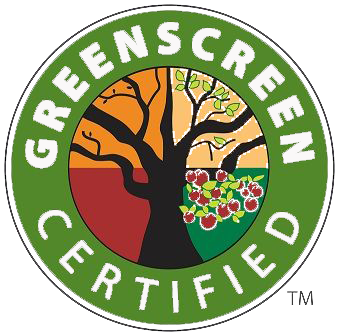 -- should develop a "green lease" contract template to make it easier for all customers to establish contracts that incentivize, rather than stand in the way, of energy savings. Disclosure of data center energy and carbon performance. Public disclosure is a powerful mechanism for demonstrating leadership and driving behavior change across an entire sector. In their corporate and social responsibility reports, industry leaders in data center efficiency should voluntarily disclose operational performance metrics, such as fleet-wide server utilization levels, and organizational performance (e.g., how they address split incentive issues internally and externally). If just half of the technical savings potential for data center efficiency that we identify in this report were realized (to take into account market barriers), electricity consumption in U.S. data centers could be cut by as much as 40 percent. Today, that would represent a savings of 39 billion kilowatt-hours of electricity annually -- equivalent to the annual electric consumption of nearly all the households in Michigan. These improvements also would save U.S. businesses and their customers a whopping $3.8 billion a year. “New practices and policies are needed to accelerate the pace and scale of the adoption of energy efficiency best-practices throughout the industry,” Pierre Delforge, NRDC director of high-tech energy efficiency said. “Nearly one-third of all leased data center space will come up for renewal over the next year, so the time to act is now to rein in such energy waste. This will put the money saved back in Americans’ pockets and the economy, and curb the pollution generated by unnecessary power plants." Short and long versions of the report are provided in the links below, along with additional coverage and analysis by NRDC available here. Download Jon Taylor and Jonathan Koomey's new report, Comatose Servers Redux (April 2017).